Have the Best Day White Water Rafting in Yosemite! Nothing can beat the thrill of flying down a rushing river at breakneck speeds! If you’re looking for a heart-pounding adventure out on the water, Yosemite National Park in California is the ideal destination for you. This stunning landscape contains the perfect setting for spending time in the great outdoors. In addition to hiking through breathtaking scenery and exploring countless mountain trails, this area out West also provides numerous opportunities for sensational white water rafting. With its close proximity to several incredible rivers, Yosemite is constantly drawing kayakers, canoers, and rafters. Discover some of the best companies for white water rafting in Yosemite to start planning your journey along some of California’s most exhilarating rivers! With trips that range from “mild to wild,” you’ll love your experience with Sierra Mac River Trips! Located out of Groveland, CA, this family-owned business strives to make sure you have the best day of white water rafting possible. Being the largest whitewater river outfitter near Yosemite, Zephyr Whitewater Expeditions provides a whole new level of excellence! Choose from a trip down the Merced River, which flows directly out of the Yosemite Valley, or white water rafting in the Tuolumne River; both include scenic views and thrilling rides to create an afternoon like no other. This company involves trips for both intermediate and advanced skill levels; embark on a Merced River trip with All-Outdoors Rafting for an exciting ride, or try something more daring by white water rafting in the Tuolumne River, or along Cherry Creek for an even more strenuous (yet rewarding) experience! Admire the jaw-dropping views of vibrant wildflowers and lush forests as you ride and float along the Merced River on a O.A.R.S. trip! After challenging yourself by tackling these wild rapids and heart-racing descents, enjoy a picnic lunch on the sunny beach by the river. American River Recreation offers two different ways to experience an adventure on the Merced River: you can take a one-day trip from Red Bud to railroad flat, filled with intense rapids and challenging navigation, or the two-day trip from Red Bud to Lake McClure, which offers more options and flexibility. With experienced guides and the most reliable equipment, American Whitewater Expeditions guarantees an amazing trip that’s both safe and fun! These fantastic rafts can fit up to seven people, so you can enjoy an exciting journey around Yosemite with your friends and family. Make the most of your time in California by indulging yourself in the most luxurious Yosemite lodging possible! 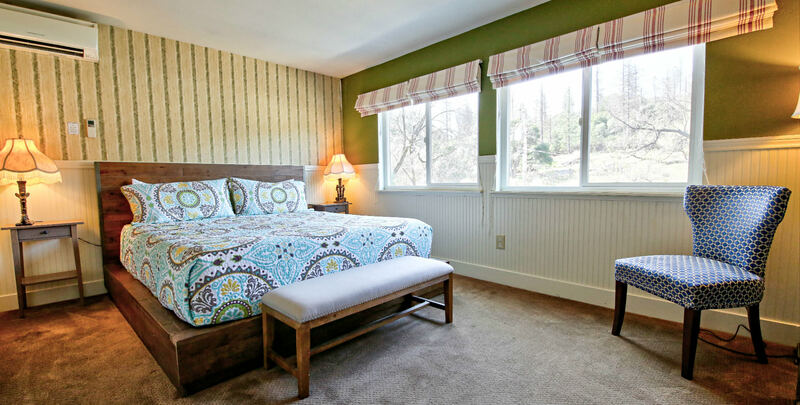 Hotel Charlotte is a historic bed and breakfast in Groveland, California, located conveniently at the gateway of Yosemite, that offers comfortable furnishings and excellent amenities within a charming, rustic environment. Choose from staying in one of our twelve lovely rooms or renting one of our cozy vacation cottages. You can explore the many attractions of our surrounding area, or simply spend time unwinding in our relaxing environment; whether you want to read in our elegant living room or try a delicious meal at our very own restaurant, you’re bound to love your experience here! Don’t wait another minute to start planning your dream vacation; check our availability and book your stay today!